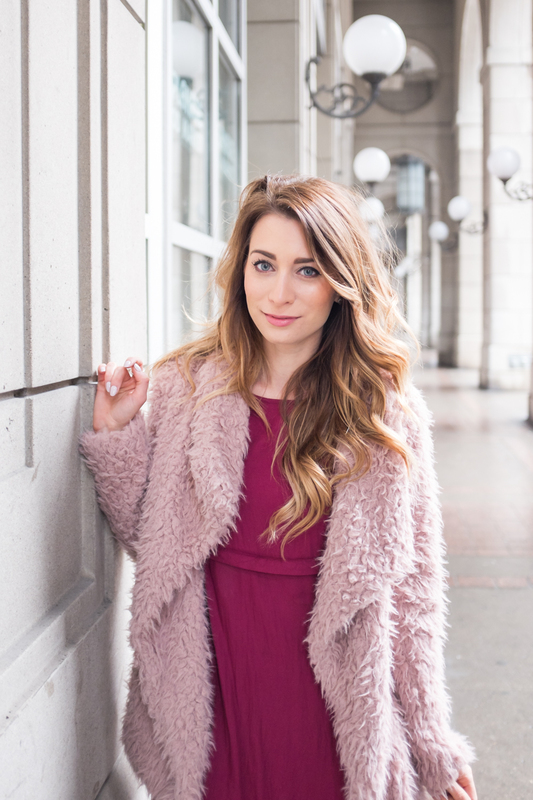 OOTD - When Your World Is Gray, Think Pink | La Petite Noob | A Toronto-Based Fashion and Lifestyle Blog. Are you at The Avenue?! I was just thinking I need to go here for a shoot- haha! Amazing. Obviously I love the coat, looking bright and fabulous. Oh - I don't know! This was on The Esplanade, is that where you're thinking of? We're totally twinning it, coat wise! I will never be able to cope with winter.I hibernate till the sun arrives.Love the colourful hues though.This weekend was abnormally gloomy.Beautiful pictures. This look is so cute!! love your coat, such a bargain! I definitely get affected by the winter months. My mood is usually at it's all time lowest, I take vitamin D everyday which actually helps because when I forget it, I feel the worst. Also hate to say it but eating less sugary treats and working out more helps too. the sugar helps when I eat it and for about an hour then the crash comes and it doubles the moodiness haha. Thank you so much for the helpful tips, Naghmeh! I definitely have a diet that mostly consists of sugar, so I really need to get ahold of that. Exercise is also something I'm slowly easing into, I have a few classes lined up in the next couple of weeks. Fingers crossed this will help with my seasonal depression! I'm definitely affected by the lack of sun! Over the summer, I used to go to the gym every day after work, but now you're lucky if I go to the gym once a week! I thrive off sunlight and these muggy, dark winter days are doing me no good lol I love the bright pop of pink that your outfit has. Bright colors should be part of the quintessential winter outfit, makes the weather much more bearable! Isn't winter brutal? As much as I can appreciate living in a corner of the world with seasons, winter does come with its challenges. I love your thoughts on mandatory colours in the winter - how cool would it be to see a sea of colourful coats instead of just your standard black?! I love the pop of colour, it adds such a cheerful touch, especially after the gloomy weekend we had! I need to take some tips out of your colour book... I need to spread my fashion wings and add some spice to my monochrome style. Very cute. You look so good in pink! And I am in love with those boots! Thank you so much Andrea! My collection of fuzzy jackets has gotten a bit out of hand, but I love all of them! I can't deal with the gloominess of winter!!! Though I've missed the last couple of years now, I try to book a trip south every January or February to help break up the winter. Another way I get through the cold, dark months is to take Vitamin D pills every day - sunshine in a bottle! I really love how the two pinks look, together and I definitely am affected by the sun as well! omg wait I love the over the knee boots as well. So first and foremost, I like the way you think! Injecting some colour into your life helps fight the winter blues, or greys, for sure! Secondly, you need to tell me where you took these pictures because I'm heading to the same location as soon as I get back! Loving this colour combo! Great way to brighten up a gloomy day.